Equipment shown is used for removal and replacement of mould lids (0.5-1 tonne weight) in resin transfer moulding (RTM) operations for the production of aircraft seat components. 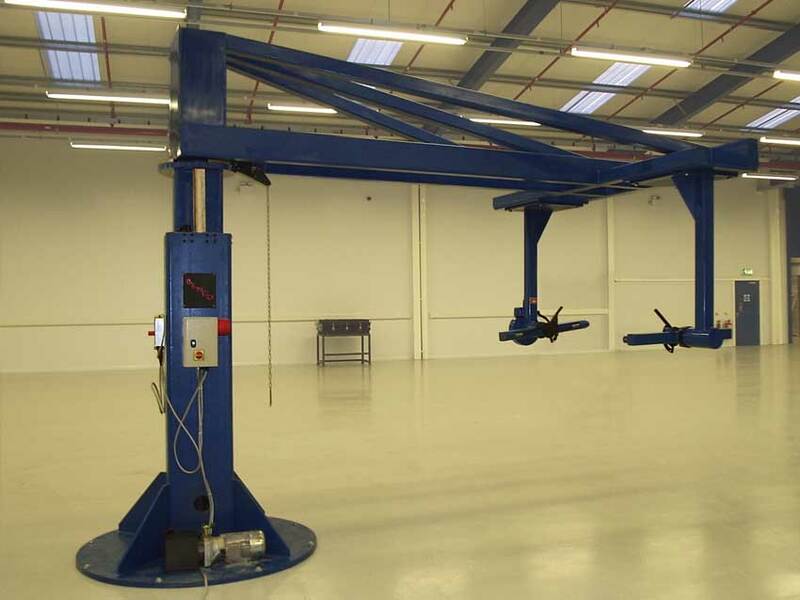 Individual cells are equipped with overhead rail-mounted scissor lifts fitted with rotating lift platforms, hydraulically operated via pendant controllers. The rail mechanisms allow horizontal movements up to 4.5m x 7.5m of the supported loads either fore and aft or side to side. The scissor lift movement provides a total lift of 1.25m (at heights of 1 to 2.5m above floor level) with a 360° rotation of the lift platform, and with all operations being carried-out with maximum safety and minimum operator effort. Special purpose jib crane unit, designed for multi-workcell operation, and used for handling 750kg loads within a resin transfer moulding (RTM) production operation. Equipment is fully compliant with Health and Safety legislation and is CE marked. 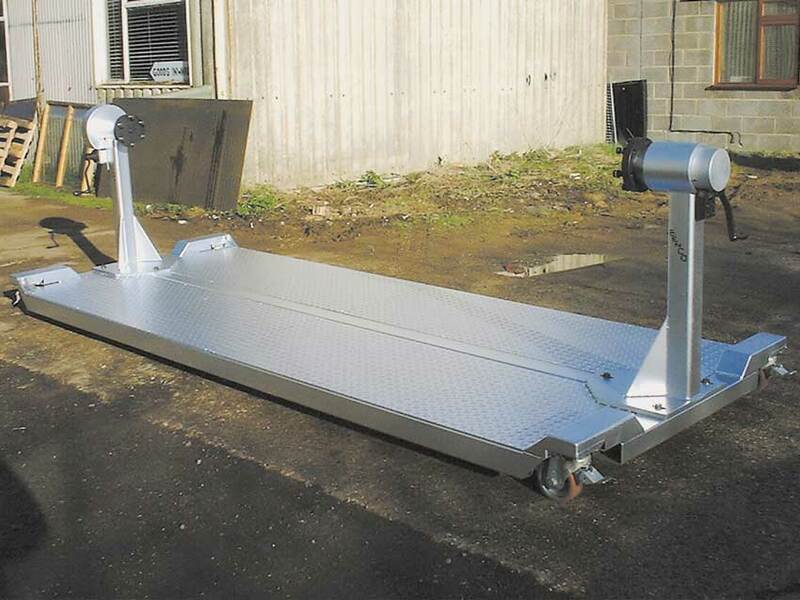 Brixworth have supplied manipulator and turnover stands for large awkward-to-handle loads of up to 600kg in weight. 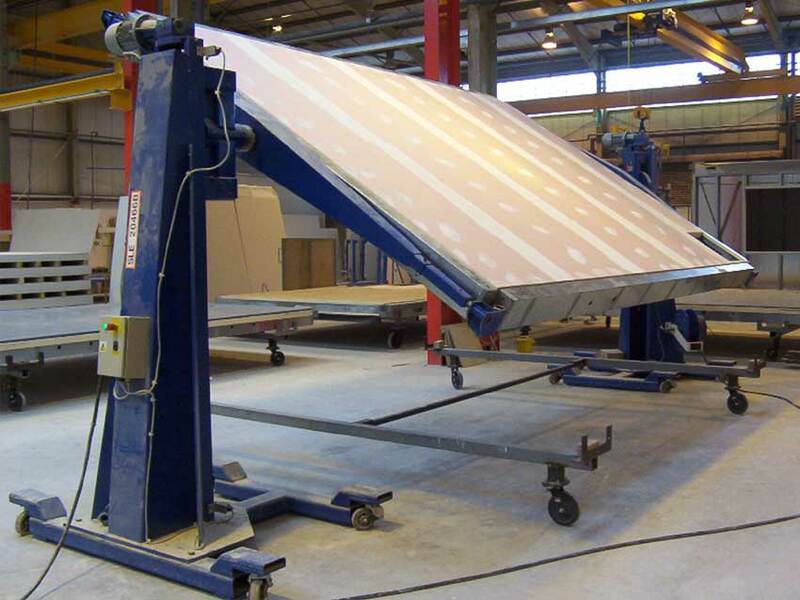 The illustration shows a plasterboard clad roof chassis (typical weight 500-600kg) being turned through 180°. This chassis is part of a modular building construction by Terrapin Ltd. 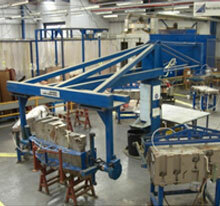 Similar equipment has also been supplied for handling boat hulls during their manufacturing process. 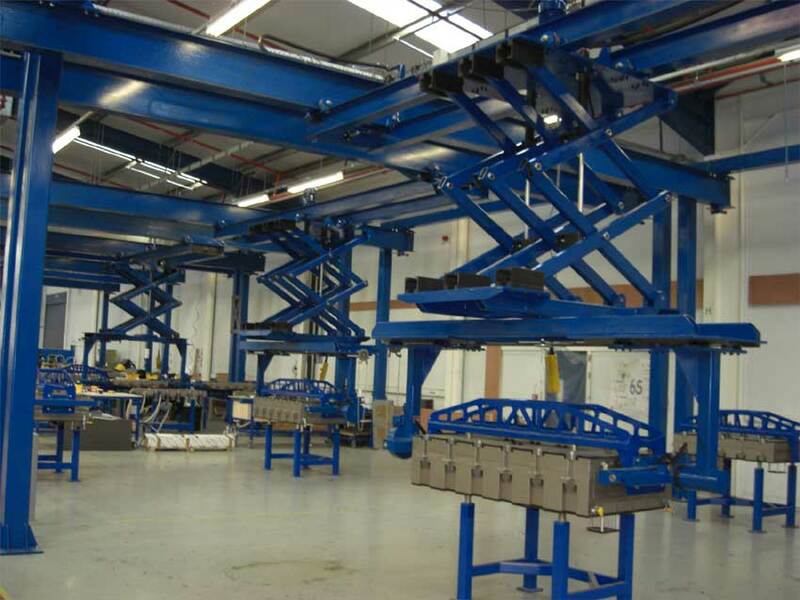 Where assembly jigs are used for production, then special purpose Benco units can be supplied with double-ended manual rotation. The example illustrated was produced for the aerospace industry and provides 3500mm between mounting flange centres, with a retracting tailstock for ease of jig mounting and changing. Good working access is provided for loads up to 3000kg.